Ohio AgrAbility has a step-by-step process for working with farmers to determine if they are eligible for Ohio AgrAbility services. Our goal is always to meet the needs of Ohio’s farmers, and work with them to decide what services, assistive technology and modifications would be best for them. Introduction and initial contact – Farmer or family member contacts Ohio AgrAbility (OAP) via e-mail or phone (614-292-0622). An OAP staff member will talk to you about your disability, what work you do, and how your disability is affecting your ability to do your work. We will share your information with one of the OAP Rural Rehabilitation Coordinators (RRC), who will call you and schedule a farm visit. Farm visit – The RRC will talk to you about your work, if you can safely use your equipment and facilities, and ask how Ohio AgrAbility can help. The RRC will ask about your ability to pay for the AT and modifications needed to help you continue farming. OAP does not have funding to purchase any equipment or supplies for farmers. The RRC will explain how Opportunities for Ohioans with Disabilities (OOD) can work with farmers to modify equipment and facilities. They will ask questions to determine your eligibility for OOD services. You do not have to use OOD services, and there is no guarantee that you will be eligible for their services. OAP and RRCs get no financial benefits from referring you to OOD, or vendors that sell AT and modifications. RRCs will suggest specific vendors or equipment because they know the quality and value is good and want to help you find the best equipment or AT for your needs. Recommendations and Referrals - The RRCs will make suggestions on how to modify your facility or equipment to make it safer and more accessible. 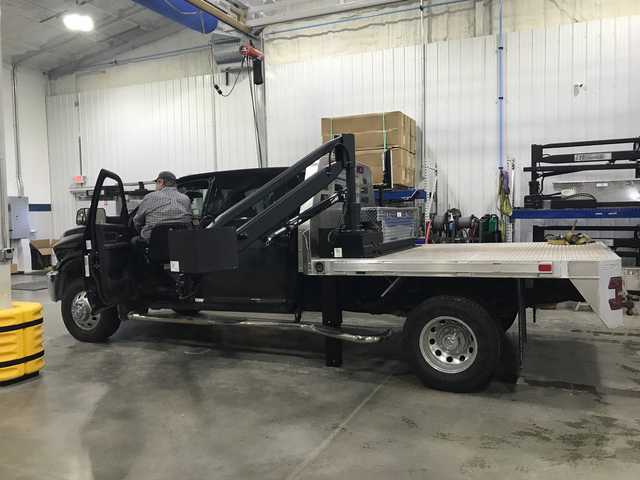 Some modifications are simple – lowering or raising a workbench to reduce strain on your back and shoulders while you work, or upgrading your tractor seat with an air ride or padded seat to ease the strain and pain from riding the tractor for hours every day. A common upgrade to equipment is to add handrails and additional steps so it is easier and safer to get on and off the tractor or other equipment. They may also suggest upgrades to the lighting in your barn and worksite, or tilt tables and chutes to manage your animals and make treating them safer for the farmer and the animal. Rural Rehabilitation Coordinators work with the farmer, and OOD (if the farmer is an OOD client) to design and develop an individualized work, modifications and Assistive Technology plan for the farmer, making sure new equipment and AT are a good match for the farmer and the work environment. Plan Implementation – If the farmer wants to implement the RRCs recommendations for modifications or AT, the RRCs will assist with looking at items and getting price quotes. When the equipment is delivered RRCs will usually be on hand to ensure that the correct equipment has been delivered and the farmer knows how to use it safely. The RRCs continue to work with farmers to make sure the new equipment and modifications are meeting the farmer’s needs, and to work with the farmer to solve problems and maintain productivity and success. Peer Network – OAP has a strong Peer-to-Peer Network of farmers and their families who have worked with OAP throughout the years. The Peers meet a few times a year for workshops and networking. OAP staff introduces new AT and modifications, shares resources from OSU Extension, and talks about safety on the farm. Peers have time to talk to one another and build friendships and connections with other farmers from across the state. For more information, please contact Laura Akgerman, Ohio AgrAbility and OSU Extension Disability Services Coordinator, at Akgerman.4@osu.edu, or 614-292-0622.